For this week’s blog we thought we’d show a couple of our arcades in situ at clients’ properties. 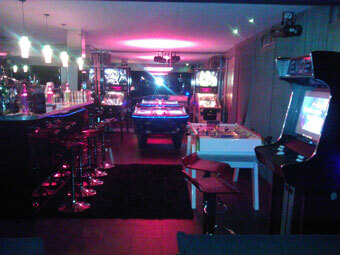 As you can see, Bespoke Arcades machines look at home in most settings. On the left- a Synergy Elite looking elegant as always. And on the right- an Evo Elite (with GT stripes) situated in a full-blown gameroom. One of our arcade machines guarantees a talking point at any gathering, ensuring all men folk have somewhere to congregate. A serious grudge can also be settled via a game of Streetfighter II. On the other hand, our arcade machines guarantee that 5 minute break is well spent, it’s also a great way to unwind after a hard day’s graft. When you unwrap a Bespoke Arcades unit, its obvious we strive for perfection. Immediately one can see all our machines are professionally sprayed and polished- we don’t use pre-laminated materials. When we started the company 6 years ago- our own brief was to develop the most luxurious commercial-quality arcade machine for the home. We feel we have achieved that, resisting outsourcing our cabinets in China (saving over 200% in costs), and continuing to have our arcade machines fabricated in London. In turn, taking the exorbitant rises in costs on the chin- as we cannot skimp on quality. As a company- we want our products to represent the virtues that “Made In The United Kingdom” signifies. As time progresses, so does hardware- we strive to innovate and next month- we have another ground breaker coming out.